In his recent February 19, 2016 decision in the case of Doe v. Cruciani, No. 2012-CV-5920 (C.P. Lacka. Co. Feb. 19, 2016 Nealon, J. 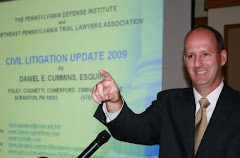 ), Terrence R. Nealon of the Lackawanna County Court of Common Pleas addressed a Motion for Summary Judgment filed by a Defendant employer to a Plaintiff’s tort action seeking compensatory and punitive damages against a plumbing supply business for negligent supervision of its employee who allegedly lured the Plaintiff’s minor daughter into his company-leased vehicle and allegedly entrapped the minor in that vehicle and allegedly had indecent contact with the minor. The employer filed a Motion for Summary Judgment asserting that it could not be vicariously liable under Pennsylvania law for its employee’s intentional and criminal acts that were outside the scope and course of the employee’s employment. Judge Nealon noted that the law required that, in order to succeed with the negligent supervision claim against an employer for injuries caused by the intentional or criminal conduct of an employee committed off of the employer’s premises and outside the employee’s scope of employment, a Plaintiff must demonstrate that (1) the employee was using movable property of the employer at the time of the conduct and, (2) the employer knew or in the exercise of ordinary care had reason to know, of the necessity and opportunity to exercise control over that employee. Judge Nealon denied the employer Defendant’s Motion for Summary Judgment with respect to the compensatory damages claims finding that evidence in the record confirm that the employee used the employer’s vehicle during the alleged assault. Judge Nealon also noted that the record established that the employer knew that the employee, who previously owned the plumbing supply business, had been previously convicted ten (10) years earlier of indecent assault of a minor girl in his company vehicle and had been required to register as a sexual offender for ten (10) years. Accordingly, Judge Nealon ruled that, although the employer contended that they did not know if the need to move closely regulate or restrict the employee’s use of the company vehicle while not on the employee’s premises, issues of fact precluded the entry of summary judgment on the compensatory damages claim where reasonably prudent employer should have known of the necessity for exercises such control due to the potential for recidivism by a sexual offender. Judge Nealon also noted that, while there was ample evidence to sustain the Plaintiff’s punitive damages claim against the individual employee, summary judgment was granted in favor of the employer on the punitive damages claim as the record did not contain sufficient evidence that the employer had engaged in intentional, willful, wanton, or reckless conduct based upon its subjective appreciation and conscious disregard of the risk of arm to others. Accordingly, the employer’s Motion for Summary Judgment on the punitive damages claim was granted. Anyone desiring a copy of this Opinion by Judgment Nealon may contact me at dancummins@comcast.net.